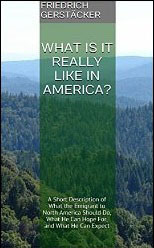 Friedrich Gerstaecker - What is it really like in America? What is it really like in America? Imagine for a moment you are a poor farmer or laborer in central Europe in the 19th century. You can barely feed yourself let alone a family, and you’ve suffered through wars and revolutions. If you are a young person, you see no hope of making a new life for yourself. If you have a family, you see no opportunities for your children or your children’s children to have a better life. You’ve heard wondrous tales of a place called America—land agents and ship companies have flooded Europe with advertisements describing how easy it is to become wealthy and free in the new land. But you’ve seen no pictures and met no one who has ever been there. If you decide to leave the only home you’ve ever known, you will likely be able to take only the belongings you can carry on your back. You will leave behind forever not only the only town you have ever lived in, but friends, family, and perhaps even some of your children. You will move to a country you have never seen, a country where you know no one, a country whose language you do not even speak. But how to know what life in America is really like? Who can answer your many questions? What is the best time of year to leave for America? What is a sea voyage like? What can I expect when I land in America? This was the situation for many would-be emigrants in 19th century Europe. Friedrich Gerstäcker, a German adventurer and prolific novelist, was born in Hamburg in 1816. Throughout his life he seemed unable to stay put in one place for any length of time. He began traveling in his early 20s and made his first trip to North America in 1837. He spent 6 years moving about the United States (spending time in Arkansas in particular), supporting himself with odd jobs along the way, and writing home about his adventures in the New World. He returned home in 1843 and using his experiences in America, published his first novel in 1845. During this time he found himself besieged by questions from people who wanted to know what life was like in America, in particular from those people who wanted to immigrate to the United States. Concerned that so many of the things Europeans heard about America were inaccurate and idealistic, he decided to write a practical guidebook for those who wanted to emigrate by presenting a realistic picture of what they could expect in the New World, answering questions ranging from the simply curious (What is seasickness?) to the practical (How do I keep from being swindled?). 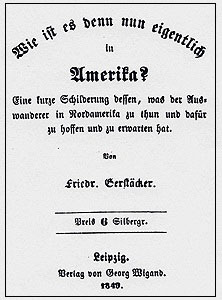 Gerstäcker published "Wie ist es denn nun eigentlich in Amerika? : eine kurze Schilderung dessen, was der Auswanderer in Nordamerika zu thun und dafür zu hoffen und zu erwarten hat" in 1849. Gerstäcker would travel again to America, and also to South America, the South Pacific, and even Australia, and continue to write both travel observations and novels. He died in Germany in 1872. This small guidebook is now available in English and will be of interest to anyone whose ancestors emigrated from Central Europe in the 19th century. Click here for information on purchasing this 19th century guidebook.